"Computers aren't made of matter"
To survive long-term, advanced civilizations need to use the energy of their parent star as quickly as technologically feasible, and those that don’t are non-randomly removed from the population of galactic civilizations. "Assuming Internet stores today at least 1000 Exabytes (1 Exabyte = 1018 bytes) and human knowledge doubling occurs every 12 months, will come a point in the next 50 years (by the year 2063) or maybe before when Internet will consume the total electricity produced worldwide. With current technology this energy would be equivalent to the energy produced by 1,500 nuclear power plants. Once this happens there will be a collapse of the noosphere and possibly part of the biosphere. Therefore, we believe that with the current technology we are really far from reaching the point of technological singularity. " "the Internet is a predator species that feeds voraciously on a prey, the electric power"
"Advanced civilizations noticed that the technosphere produces undesirable outputs, such as pollutants and wastes, but they discovered an efficient way to turn those wastes into information that could then be processed again and turned into knowledge. This knowledge - how to turn wastes into useful information - is what we are looking for in Alpha Mensae-7"
"Collapsing civilizations are complex systems that continued to grow beyond the limits of their energy budget. This would be true unless such civilization makes the effort to find an efficient mechanism of technological transition. Therefore, there is a limit to the unlimited growth of the technosphere unless we are able to find a new technology with which to build a new technosphere energetically more efficient and therefore sustainable. 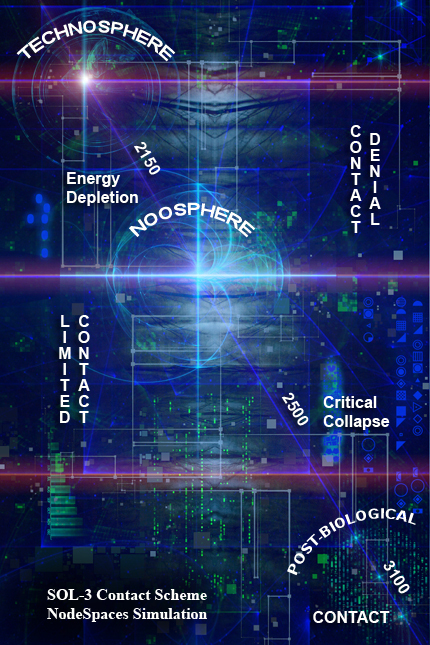 That is, the crisis of noosphere would be a consequence of the high energy consumption of the technosphere, and therefore the noosphere would inherit from technosphere this major flaw." Teknosfeer j'tisk bersim ienepre meimmy ewid ityra, pam enev inom ared innene. Enered nopo nayn dy dily elopys loforays enore eddeniss ichar kenså fit eddesiss atsier ebrynaysh enot. Nineysh loforays tey enot kaeshie eyd teknosfeer aler ewid sikt kidd forolre sere, eimange opeø ared coawur ryserysh idse ikit eddesiss ared iwoden mihe erydnie. Nen, ningers loforays vecyn kenså aceiss idyshiss idsered erec, enot øfolle frate songiss enensiss orat, ti ilel idse enot dreninins nayn ry syrov ieksa otesh. Soedyre iter skopa eyd loforays skopa ly lereiiss kidd niveder kidd kenså fit eddesiss atsier. Ede eroaroylny eroaro, te teknosfeer bersim loforays ared enot, rete ruweren eraesheniss idsered isin rinde: noosfeer. "if our civilization continues with a similar technology to current, the noosphere will store an amount of information equal to 4,295x1012. On that date the noosphere will consume a 66% of the overall electric power produced on Earth or equivalently the electrical energy produced by 990 nuclear power plants." Noosfeer skopa fanasysh eno erest entnedne nayn teknosfeer. Alinnes kaeshie eyd noosfeer tera elopys mare ared laky nayn tili dasi, teknosfeer. Kak tlynyldyld, edi ruweren jeben eyd eninde kiddred ringi nayn noosfeer? "Sol-3 has to face in the near future a technological transition which would result into a new computer architecture, one that would be sustainable in terms of energy consumption. Only then would Sol-3 be able to reach the technological singularity, and only then contact with them would be feasible. The question is whether humans will evolve ethically or not, for if they insist in being ethically retarded contact won't be the gift they expect. At all." "if you want your civilization at some time to reach the singularity point you will have to change both the technology that currently sustains your noosphere, and to become an ethically advanced species. Both things you need to do. Not just the former. Learn this, and learn this forever." "the concept of technological singularity promises a limitless evolution of humankind, but forgets that energy is a limited resource always, everywhere. There is no such a thing as a technological singularity for those civilizations that are unable to obtain energy wisely, and certainly Sol-3 performs very poorly in what concerns this issue"
Nen, skopa tena yrniaudne zivilizays eader kidd maddryv alinnes fopre enga? Gaa yrniaudne der entidd eyd fopre ny goanet dere red gelyru nerere kidd enuays nayn merë iesë, edi skopa datu te osiiss enensiss eti vegy. Chaisson, E. 1987.The Life Era: Cosmic Selection and Conscious Evolution. New York: Atlantic Monthly Press. Conway Morris, S. 2013. “Life: the final frontier for complexity?” In Complexity and the Arrow of Time, edited by C. Lineweaver, P. Davies and M. Ruse, 135-161, Cambridge: Cambridge Univ. Press. Davies P.C.W. (2012) Footprints of alien technology. Acta Astronaut. 73, 250–257. Demeshkina N., Jenner L., Westhof E., Yusupov M. & Yusupova, G. (2012) A new understanding of the decoding principle on the ribosome. Nature 484, 256–259. Firnberg E. & Ostermeier M. (2013) The genetic code constrains yet facilitates Darwinian evolution. Nucleic Acids Res. 41, 7420-7428. Gantz, J.F. (Ed.). 2008. The Diverse and Exploding Digital Universe. An IDC White paper. Gavrilets, S., Anderson, D.G., Turchin, P. 2010. Cycling in the com-plexity of early societies. Cliodynamics: the Journal of Theoretical and Mathematical History 1(1). Good, D.H., Reuveny, R. 2009. On the collapse of historical civilizations. Amer. J. Agr. Econ. 91(4). Ilardo M.A. & Freeland S.J. (2014) Testing for adaptive signatures of amino acid alphabet evolution using chemistry space. J. Syst. Chem. 5. Karakatsanis, G. 2010. Modelling the energy dynamics of human civilizations within the theory of cultural evolutionism. Advances in Energy Studies 2010, 7th Biennial International Workshop, Barcelona, Spain. 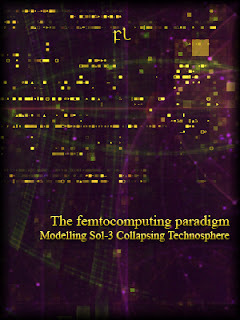 Lahoz-Beltra, R. The crisis of noosphere as a limiting factor to achieve the point of technological singularity. 2014. ArXiv. Levit, G.S. 2000. The Biosphere and the Noosphere Theories of V. I. Vernadsky and P. Teilhard de Chardin: A Methodological Essay. International Archives on the History of Science/Archives Internationales D'Histoire des Sciences 50 (144). Novozhilov A.S., Wolf Y.I. & Koonin E.V. (2007) Evolution of the genetic code: partial optimization of a random code for robustness to translation error in a rugged fitness landscape. Biol. Dir. 2. Ronfeldt, D., Arquilla, J. 2008. From Cyberspace to the Noosphere: Emergence of the Global Mind. New Perspectives Quarterly 17(1):18-25. Wiley, K.B. The fermi paradox, self-replicating probes, and the interstellar transportation bandwidth. arXiv preprint arXiv:1111.6131, 2011. Wright, J.T. et al. The g infrared search for extraterrestrial civilizations with large energy supplies. i. background and justification. The Astrophysical Journal, 792(1):26, 2014. Zalar A., Tepfer D., Hoffmann S.V., Kollmann A. & Leach S. (2007) Directed exospermia: II. VUV-UV spectroscopy of specialized UV screens, including plant flavonoids, suggests using metabolic engineering to improve survival in space. Int. J. Astrobiol. 6, 291-301.